The Tartarus Rim: She's not made of paper, Captain! She's not made of paper, Captain!
. . . except when she is. 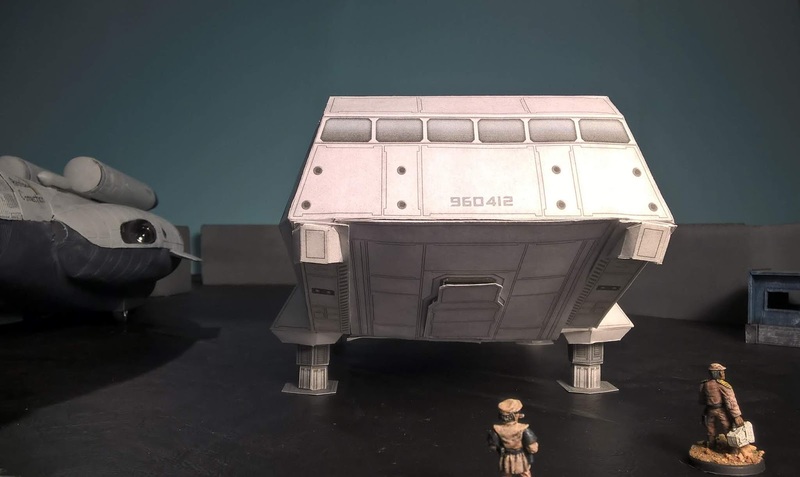 Paper is, in fact, the structural material of the sturdy little Genet VT-3 Pinzgauer. You've probably seen this in the background of some of my pictures before, which is where it's really intended to go, but it deserves at least a moment in the sun. This build largely overlaps with the MB-1377 StarLifter Rainbow Connection. 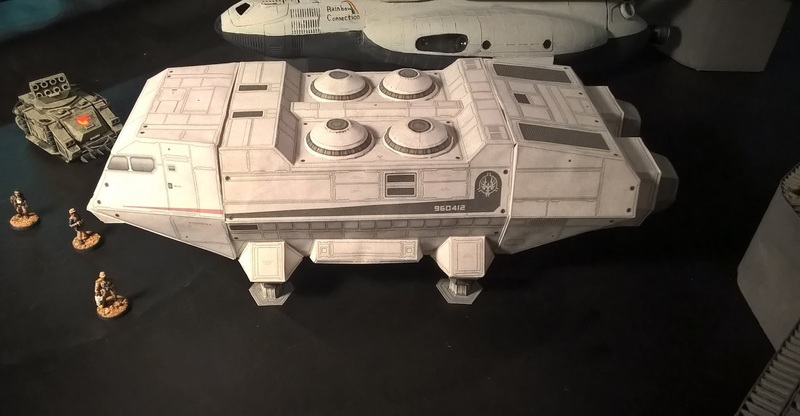 I think I started the StarLifter first, but that took a long time in gestation and I wanted something faster, so I turned to paper models. This was to be an experiment. The first part of the build went quickly enough to use as a set piece in some photography in late 2017. (So far so good.) But as things are wont to go, I got distracted and turned to shinier things and this sat. Long enough, in fact, that I lost parts. (Which is no big deal when they're made of paper.) But after I finished Rainbow Connection I decided I really needed to put the tail end on the Pinzgauer and finish the last details. Before I get into the nitty gritty of how this works let me expound a little on the model. The Pinzgauer seems a clear reference to Battlestar Galactica. The general arrangement and proportions of the ship are very close to the original series shuttle. The sigil on the side of the default paint version is quite close to the new series symbol. It's simplified for ease of construction. (More on that later.) But really, it's not too bad at all. Even the original was pretty boxy. But what of the name, you say? Well, apart from being a breed of Austrian draught horse it's also apparently the name of a line of high-mobility trucks. Absurdly boxy things, even. Altogether a good heritage for a utility cargo shuttle, I'd say. Who knew? Now, back to the build. As I said, this was an experiment. I probably worked faster than I should have. More care and a more forgiving glue than the CA+ that I impatiently insist on using for . . . everything . . . might have helped. But you know what? It worked. And here's the neat thing about paper models: You really have to pay attention to structure. That sturdy thing at the beginning isn't really a joke. The thing is well enough engineered (with beams and braces and gusset plates) that it actually holds together. It doesn't feel like it will fold up in the first breeze. It's still paper. You can crush it. (Or dent it. Or bend it.) It will flex. Much like a real airplane. But there's real structure in there. And there are void spaces galore where real systems would actually fit. That's kind of neat, really. I don't know that I'd engineer my ship so that the entire belly of the thing would become a giant elevator to lower things to the ground, but at least then you'd know the doors were properly locked. (Would help to avoid the kinds of disasters that befell the DC-10, C-5, and 747 when the sudden depressurization from doors that only looked closed broke important parts.) Of course, it does mean I can't so easily actually put a model inside the thing and leave it there, but that's a small complaint, really. It's primary function is to LOOK like it can carry something. It's quite good enough when that something fits. I said they're fairly sturdy because of their internal structure, but as a result they do take a little longer to build than you might guess. There's nothing especially complicated. It's all cutting, folding, and gluing. Nothing fancy. But there's a lot of it. There are fully 42 ANSI A letter sized pages of printed parts. The thing is almost a novella. That's a lot of parts to cut out. And there are some complex and persnickety folds. Nothing truly origami grade, but still plenty of it. That's what makes it hold together and look halfway neat. 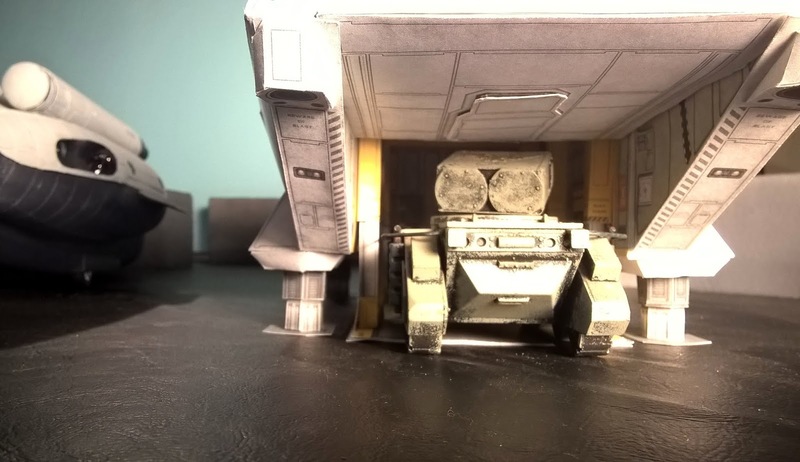 What's more, I suspect you could make the things quite a bit sturdier still by building them from cardstock, which you could then paint and detail. At that point it might even be a serious foreground grade model. Even as is I think it's not bad, but I'll let you judge. I do cheat and use a small piece of tape to hold the chin up. I think if my build were more precise it would probably stay up on its own, but that is one of the weak features. The pedestrian ramp doesn't stay closed well and the chin doesn't stay up. And it's a touch weak at the rear away from the folds. (Which I solved by adding in a piece of cardscock as reinforcement. Much like you might reinforce a real vehicle when you realized the manufacturer's design had a spot prone to trouble.) So the verdict: it's not quite as quick as I would have hoped, but it looks good and works better than I expected. And the price was fantastic. The plans are free, so all it costs is time and materials. Paper. Not bad! Genet Models actually has a whole line of stuff. Check them out. They have plenty of other fun and free paper things to keep you building. 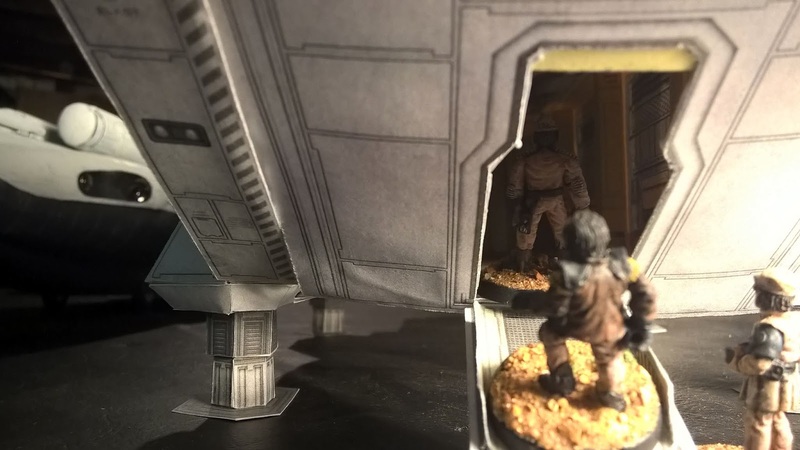 Papercraft builders are on their own level. You can put another notch in your blaster handle now. NICE! Well, another ship in the starport, anyway. Thank you. :) Did you see that the MB-1377 you promised me showed up? (Previous post.) Those creds worked out. And some of the excess covered the Pinzgauer quite nicely. I missed the previous post. I musta been napping! Some days a nap is the only cure for what ails ya. Yesterday, for example. Possibly today too. You can't argue with a good nap, really. Terrific. I also have that one, but I have never found the willpower to start. You have my utmost admiration. Thank you! I suspect once you get started you'll find the going easier than you thought. And maybe also more rewarding. It turned out very well. I was quite a fan of paper building for a while but mostly had chunky unpainted stuff. I found it was pretty easy to knock across the table too (too light). I'm particularly impressed with the half circle things (fans?) on the dorsal/roof/back.....very tricky to do with paper. Is there some sort of cheat there? No cheat. They were a royal pain in the rear end. (And I'm not completely happy with them.) Each is four parts. A circular bottom and a very small circular top, and two roughly conical parts in the middle in decreasing sizes. The two cone sections each have a jillion tiny little cuts as though made with pinking shears of three different sizes. (I do not, of course, have even one pair of pinking shears.) I glued my fingers a lot. I cursed more than usual. And I used some tape on the last two. (Hey, it's paper. Dang it, tape is good stuff.) The tape might be cheating, but I still glued them as well, so I figure it's probably okay. Hah. Yes, that all sounds about par for the course for nice curvey things. I remember fighting with some fan vent things for quite some time and it was cylindrical so missing a second curve relative to your annoyances. Yeah, these are kind of small semi-domes. Two very shallow cones and a circle pretending to be a partial sphere. There are so many awesome downloadable paper objects you can get these days...the mind boggles at the possibilities. I've scoured the net a few times, grabbing all the free ones, with a purpose to build some vast cityscape or armoured vehicle column, but I never do......just have heaps of them on my hard drive. Thank you! I have a bunch more downloaded myself. For the same reasons. (And some stuff set aside for projects.) Next up is a few more vehicle conversions, but after that I might try some cardstock adaptations of paper buildings. The result of course is quite nice. Could you do another one without the moving ramps and such to build faster? After all, like buildings, if one looks on the table how good would it look with five? Very nice walk-through and review. I've admired a lot of Genet stuff, and I keep my link active, but have yet to attempt a build, so this was definitely a useful and informative post.